The Jackson’s Chameleon is an African chameleon belonging to the family Chamaeleonidae. They are native to the humid, cooler regions of Kenya and Tanzania, East Africa, found in great numbers at altitudes over 9000 feet. They are sometimes called Three-horned Chameleons because males possess three brown horns, one on the nose and one above each superior orbital ridge above the eyes, somewhat reminiscent of Triceratops. Their adult size is 12 inches in total length. The subspecies xantholophus was introduced to Hawaii in the 1970s and has since established populations on all main islands. This population was the primary source of Jackson’s Chameleons for the exotic pet trade. However, the exportation of these animals has been made illegal to prevent opportunists from willfully establishing feral animal populations in order to capture and sell them. Jackson’s chameleons live primarily on a diet of small insects. They are less territorial than most species of chameleons. Males will generally assert dominance over each other through color displays and posturing in an attempt to secure mating rights, but usually not to the point of physical fights. The concerto grosso, Italian for big concerto, is a form of baroque music in which the musical material is passed between a small group of soloists (the concertino) and full orchestra (the ripieno). The form developed in the late seventeenth century, although the name was not used at first. Alessandro Stradella seems to have written the first music in which two groups of different sizes are combined in this characteristic way. The first major composer to use the term concerto grosso was Arcangelo Corelli. After Corelli’s death, a collection of twelve of his concerti grossi was published; not long after, composers such as Francesco Geminiani and Giuseppe Torelli wrote concertos in the style of Corelli. He also had a strong influence on Antonio Vivaldi. Two distinct forms of the concerto grosso exist: the concerto da chiesa (church concert) and the concerto da camera (chamber concert). The concerto da chiesa alternated slow and fast movements; the concerto da camera had the character of a suite, being introduced by a prelude and incorporating popular dance forms. These distinctions blurred over time. Corelli’s concertino group was invariably two violins and a cello, with a string section as ripieno group. Both were accompanied by a basso continuo with some combination of harpsichord, organ or lute. Handel wrote several collections of concerti grossi, and several of the Brandenburg Concertos by Bach also loosely follow the concerto grosso form. The concerto grosso form was superseded by the solo concerto and the sinfonia concertante in the late eighteenth century, and new examples of the form did not appear for more than a century. In the twentieth century, the concerto grosso has been used by composers such as Igor Stravinsky, Ernest Bloch, Ralph Vaughan Williams, Bohuslav Martinů, Malcolm Williamson, Henry Cowell, Alfred Schnittke, Krzysztof Penderecki and Philip Glass. Rattan is the name for roughly 600 species of palms native to tropical regions of Africa, Asia and Australasia. They are not trees but are vine-like, scrambling through and over other vegetation. Unlike bamboo, rattan stems are solid. Most species need structural support and cannot stand on their own. Many rattans have spines which act as hooks to aid climbing over other plants, and to deter herbivores. Rattans are extensively used for making furniture and baskets. When cut into sections, rattan can be used as wood to make furniture. Rattan accepts paints and stains like many other kinds of wood, is available in many colors, and can be worked into many styles. Moreover, the inner core can be separated and worked into wicker. Along with birch and bamboo, rattan is a common material used for the handles in percussion mallets, especially mallets for keyboard percussion. The fruit of some rattans exudes a red resin called dragon’s blood. This resin was thought to have medicinal properties in antiquity and was also used as a dye for violins. In early 2010, scientists in Italy announced that rattan would be used in a new process for the production of artificial bone. The wood is heated under intense pressure with calcium and carbon, and a phosphate solution is introduced. The process produces almost an exact replica of bone material. It has been tested in sheep and there had been no signs of rejection. In forests where rattan grows, its economic value can help protect forest land by providing an alternative to loggers who forgo timber logging and harvest rattan canes instead. Rattan is easier to harvest, requires simpler tools and is much easier to transport. It also grows much faster than most tropical wood. This makes it a potential tool in forest maintenance since it provides a profitable crop that depends on rather than depletes trees. 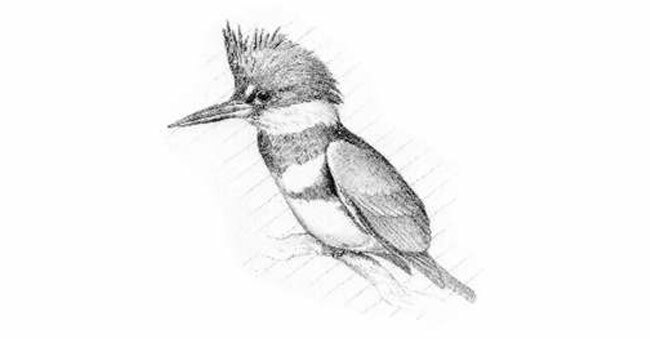 The Belted Kingfisher is a stocky, medium-sized bird with a large head and a shaggy crest. Its long, heavy bill is black with a grey base. Both sexes have a slate blue head, large white collar, a large blue band on the breast, and white underparts. It is often seen perched prominently on trees, posts, or other suitable watchpoints close to water before plunging in head first after fish. It also eat amphibians, small crustaceans, insects, small mammals and reptiles. The Belted Kingfisher migrates from the northern parts of their range to the southern United States and Central America in winter. In warmer areas it is a permanent resident. It frequently announces its presence with a loud rattling cry. The breeding distribution of the Belted Kingfisher is limited in some areas by the availability of suitable nesting sites. Human activity, such as road building and digging gravel pits, has created banks where kingfishers can nest and allowed the expansion of the breeding range. Bauhinia purpurea is a species of flowering plant in the legume family native to Southeast Asia. Common names include Hong Kong Orchid Tree, Purple Camel’s Foot, and Hawaiian Orchid Tree. It is an evergreen tree or vine with large thick leaves and striking purplish red flowers. The fragrant, orchid-like flowers are usually 3-5 inches across and bloom from early November to the end of March. The generic name commemorates the Bauhin brothers Jean and Gaspard, Swiss botanists. The two lobes of the leaf exemplify the two brothers. Although now cultivated in many areas, it was discovered in 1880 near the ruins of a house on the shoreline of a western Hong Kong island near Pok Fu Lam. Apparently, all of the cultivated trees derive from one cultivated at the Hong Kong Botanic Gardens and widely planted in Hong Kong starting in 1914. The Bauhinia double-lobed leaf is similar in shape to a heart or butterfly. A typical leaf is 7 inches wide, with a deep cleft dividing the apex. Local people call the leaf “clever leaf” and regard it as a symbol of cleverness. Some people use the leaves to make bookmarks in the hope that the bookmarks will bring them good luck in their studies. Sea Purslane or Shoreline Seapurslane (Sesuvium portulacastrum) is a mat-forming, creeping seaside plant in coastal areas. It helps stabilize shorelines and dunes and is very useful for preventing erosion. It is native to the southeastern coastal US from North Carolina south through Florida, the Keys and throughout much of or all of the Caribbean. It has thin, short, leathery leaves that are about 1″ long and thick, smooth stems of up to 3 feet. It also has attractive, small, somewhat inconspicuous white to purple or pinkish blooms. The tiny flowers are solitary in the leaf axils and bloom all year. The leaves are edible, contain valuable vitamins and minerals, and have a crisp, salty taste. Medicinally this plant has been used to treat scurvy, a vitamin C deficiency and is sold in Asia as a vegetable. In the Caribbean, the leaves are pulverized and used to soothe puncture wounds caused by venomous fish. Emergence is the way complex systems and patterns arise out of a multiplicity of relatively simple interactions. It has been described as the creation of novel and coherent structures, patterns and properties during the process of self-organization in complex systems. Emergent properties appear when a number of simple entities operate in an environment, forming more complex behaviors as a collective. Unintended consequences and side effects are closely related to emergent properties. Common characteristics include features not previously observed in other systems, and integrated processes that maintain themselves over a period of time. The internet is a popular example of a decentralized system exhibiting emergent properties. There is no central organization rationing the number of links, yet the number of links pointing to each page follows a power law in which a few pages are linked to many times and most pages are seldom linked to. Another important example of emergence in web-based systems is social bookmarking, also called collaborative tagging. In these systems, users assign tags to resources shared with other users, which gives rise to a type of information organization that emerges from this crowdsourcing process. The Red Mangrove is distributed in costal ecosystems throughout the tropics. It forms a characteristic saline woodland habitat called a mangrove swamp, growing on aerial prop roots which arch above the water level giving stands of this tree a characteristic appearance. Because they are well adapted to salt water, they thrive where many other plants fail and create their own ecosystems called mangals. The roots act as an ultra-filtration mechanism to exclude up to 97% of the salts from the costal saline water. Salt which does accumulate in the plant concentrates in old leaves which the plant then sheds. Red mangroves absorb air through pneumatophores, specialised root-like structures which stick up out of the soil like straws for oxygen intake. These “breathing tubes” typically reach heights of up to thirty centimeters, and in other species, over three meters. Mangroves protect coastal areas from erosion and storm surge during hurricanes. 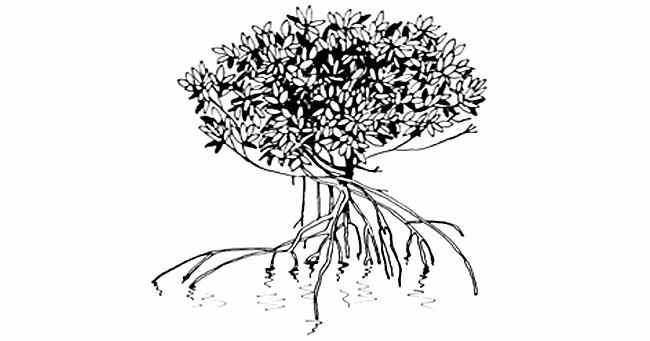 The mangrove’s massive root system is efficient at dissipating wave energy. They slow down tidal water enough that sediment is deposited as the tide comes in, leaving all except fine particles when the tide ebbs. Because of the uniqueness of mangrove ecosystems and the protection against erosion that they provide, they are often the object of conservation programs. Ludwigia arcuata, or Long-Stalked Seedbox, is a species native to the southeastern United States, where it grows creeping or submersed in swampy environments and along the edges of rivers and ponds. Though it is one of the most delicate Ludwigia species, Ludwigia arcuata is somewhat of a mainstay among aquatic plant hobbyists. It is normally available as “Needle Leaf Ludwigia” and can be procured through most internet aquatic plant retailers. The pollen grains are loosely held together by viscin threads, meaning that only bees that are morphologically specialized to gather this pollen can effectively pollinate the flowers. It is easily propagated from the seeds as well as from cuttings.